Shelton, Conn. – January 30, 2019 – Hubbell Wiring Device-Kellems is pleased to announce our new 20 amp pop-up receptacle, UL Listed for countertop applications and permanent installations. To protect against spills, the receptacle assembly is sealed with patent pending silicone gaskets to repel liquids in both the down and up positions. The countertop receptacle is UL Listed to 498 Section 146 to be water resistant to a half gallon of liquid spilled on the device. The receptacle face is perpendicular to the surface when in use. To switch between the down and up positions, the user simply pushes down on the device to initiate the pop-up function. Patented Tamper-resistant Cam Action outlets incorporate internal mechanisms to limit access to the energized internal components while allowing the user to insert a plug with little to no extra effort. Hubbell's new 20 amp Pop-Up Countertop Receptacle is designed to be used in commercial applications such as restaurants, education facilities and offices. The Pop-Up Countertop Receptacle can be installed on almost any surface, bringing power to wherever you need it – and protecting the device against damage when not in use. Installable in surface or flush mount options, the Pop-Up Countertop Receptacle is available in seven different finishes to compliment virtually any décor. They are available in black, white, brushed aluminum, brushed brass, brushed nickel, polished chrome, and matte bronze. 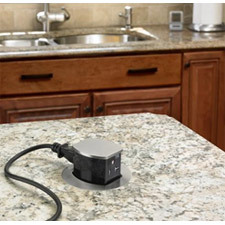 “As the first pop-up receptacle to be UL Listed for countertop applications and permanent installations, the Hubbell Countertop Receptacle is built to comply with the latest National Electrical Code (NEC) requirements,” says Vic Flagello, Director of Residential Marketing for Hubbell Wiring Device-Kellems. For more information about Hubbell’s new Pop-Up Countertop Receptacle, contact your Hubbell sales representative or visit www.hubbell-wiring.com.